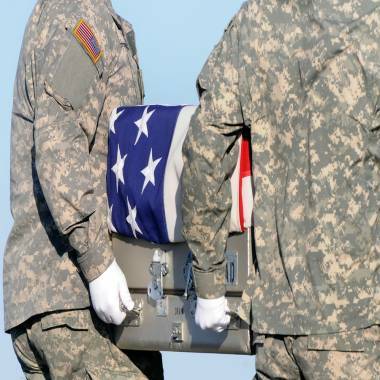 The Air Force confirmed Thursday that unclaimed remains of 274 U.S. service members were disposed of in a Virginia landfill between 2003 and 2008. NBC's Jim Miklaszewski reports. The incinerated partial remains of at least 274 American troops were dumped in a Virginia landfill, according to government records, The Washington Post reported on Thursday. Air Force officials said that the dumping was hidden from families who had given authorization for the remains to be disposed of in a respectful and dignified manner, according to the newspaper. There were no plans to inform families, officials told the newspaper. New information revealed that the practice, exposed by The Washington Post in November, had become very widespread until it was halted in 2008, the newspaper reported. Last month, Pentagon and Air Force officials said that figuring out how many remains were sent to the King George County, Va., landfill would take combing through the records of more than 6,300 troops. "It would require a massive effort and time to recall records and research individually," Jo Ann Rooney, the Pentagon's acting undersecretary for personnel, said in a Nov. 22 letter to Rep. Rush Holt (Dem.-N.J.), who has pressured the Pentagon for information on the issue on behalf of one of his constituents, according to the newspaper. An Army carry team moves a transfer case containing the remains of a soldier on Oct. 15, 2011 at Dover Air Force Base, Del. Holt reacted angrily to the news, the newspaper reported. "What the hell?" he told the Post. "We spent millions, tens of millions, to find any trace of soldiers killed, and they're concerned about a 'massive' effort to go back and pull out the files and find out how many soldiers were disrespected this way?" "They just don't want to ask questions or look very hard," he added, according to the newspaper. According to records the military gave The Post, between 2003 and 2008, 976 fragments from 274 personnel were cremated, incinerated and dumped in the landfill. An additional 1,762 remains, which could not be DNA tested because of damage from explosions, were gathered from the battlefield and dumped in a similar manner, the Air Force told the newspaper. The widow of an Army sergeant killed in Iraq told the newspaper she was furious when she was told how some of her husband's remains were dumped in the landfill. "They have known that they were doing something disgusting, and they were doing everything they could to keep it from us," Gari-Lynn Smith told the newspaper. She had been pressing the military for information on the subject for four years — ever since she got a report on her husband's autopsy and learned that some of the remains had not been put in the casket for his funeral, according to The Post. Changes in disposal policies came about after an in-depth review at Dover was ordered in 2008 by then-Defense Secretary Robert Gates.